Ashton: you are the weakest link. Goodbye. The right question to pose – but what prospect for any answers? For the EU reaction to developments in Egypt has been somewhere between bland and non-existent. EU High Rep Cathy Ashton released two statements on Thursday and Friday last week, and President of the European Council Herman van Rompuy released a statement on Saturday. More from Kosmopolit here. These public positions do not go beyond a basic iteration of the need for non-violent behaviour on both sides, and for respect for human rights. Importantly there’s no mention of what should happen in Egypt, no way forward. Let’s not forget: Egypt is very much within the EU’s sphere of influence. Presumably due to the lack of any coherence from the EU, Cameron, Merkel and Sarkozy did get together to release a statement on Saturday – it’s stronger in its tone, and calls on Mubarak to commit to the reforms he has promised. It also mentions the crucial issue of keeping communications routes open. These words from the leaders of Europe’s big three countries are similar in tone and direction to Obama’s statement on Friday. So with three European leaders essentially jumping the gun and being more concrete in their demands, where does that leave the EU’s efforts to achieve a coherent voice in international affairs? In all of this the vacuum at the very centre is deafening. Van Rompuy has many responsibilities, so the critique should not rest with him. No, the buck stops with High Rep Ashton. Why has she been incapable of mustering up some strong words? Putting herself about on television, explaining what the European Union could be doing? Phoning Member State governments to deliver a statement of the 27 (rather than just 3) on Friday last week? It’s not even as if a consensus would be that hard to achieve on this. Even Italy is proposing a crisis mission. The problem here is a lack of guile, a lack of guts, a lack of determination to push for a proper EU foreign policy. We’re now a year on from Ashton’s appointment, and this is not the first time we’ve been in a situation like this. There have been rumours about her commitment to the job, and she’s even needed a letter backing her from the UK and Sweden in the past. I see no prospect for any improvement, and because of the three EU countries going it alone on this issue, it seems a number of Member States see things the same way. It’s a public statement that they don’t back her, and that putting a weak person in the EU’s top foreign policy job was not in the interests of the larger member states as they perhaps once thought. Ashton needs to be removed, and replaced. Now. Otherwise the EU is going to stagger from one foreign policy crisis to the next between now and 2014, and we can’t afford that to happen. Merkel, Sarkozy, Cameron – if you can collaborate on Egypt, how about collaborating on forcing a change at the top in Brussels? In the meantime things have moved on – Ashton has been a little more concrete before today’s FAC meeting, and Bildt has tweeted this. Le Monde has also had a go at Ashton (paywalled, so I can’t read all of it). Vihar Georgiev has also written a good post about the statements of EP President Jerzy Buzek throughout all of this. While Buzek might lack the formal responsibility of Van Rompuy or Ashton he’s always ready to stand up for the cause of freedom and democracy, and do it in stronger terms than anyone else at EU level. Long may it continue. Marietje Schaake (who has been saying the right things on Egypt as she does on so many foreign policy / human rights matters) has just pointed me towards Ashton’s press statement today. I cannot begin to describe how lousy those words are – even worse than Ashton’s statements at the end of last week. Pitiful. The Charlemagne blog of The Economist has a roundup of goings-on around Ashton and the foreign ministers. Ekathimerini (in English) takes a similar line. Neither piece proposes a way forward though. Coincidentally David Miliband yesterday made an appearance in Parliament in Westminster – although not on foreign policy. So it’s Baroness Ashton then? Good post John. I said something similar re Cath Ashton’s useless statement on Western Sahara here. 1) She claims that she had advance sight of the UK/France/Germany stance. 2) That she had already made a statement in advance of that. Indeed, the UK and the USA have been criticised for having a confused line on Egypt and they’re sovereign countries who can speak their own mind. I am not clear what it is any of you think would be achieved by the high representative’s running out and making a statement instead of national governments. Crucially, it would not have made a blind bit of difference to the people of Egypt and it seems to me that we’re concerning ourselves more with undemocratic structures within the EU than we are the democratisation of Egypt and Tunisia. I totally agree with Brittopic. It was evident that its first occupant, would be responsible for the instituton’s subsequent boost. Based on this reason the leaders chose a weak person for the post, as they prefer an internationally weak Union, which does not disturb their own national weight in their respective countries. This is the result of a European policy focused on national interests, and selfishness that are boldly put ahead of community interest. A very interesting article, direct and forthright. Just apologize for my English. Karen asks he right questions! You write “Presumably due to the lack of any coherence from the EU, Cameron, Merkel and Sarkozy did get together to release a statement on Saturday”. But Cameron, Merkel and Sarkozy ARE THE EU! So they speak for themselves and ignore the meaning of the Lisbon Treaty’s “speaking with a single voice”. Blame the right ones…. Pingback: bloggingportal.eu Blog & Support » Blog Archive » The Week in Bloggingportal: Where the hell is Ashton? The big countries are out on their own again… And you can again ask where is Ashton and why are the big countries not using “proper procedures” e.g. PSC and allowing Ashton to have a voice in this. But also where does this leave the small EU countries, who were not invited (or where they? – I doubt it though) to join this statement. Perhaps this is a sign of the EU institutions and the small EU countries being sidelined and not just a question of is Ashton good enough. What is the procedure for formulating a common foreign policy on something like this? My understanding is that Baroness Ashton would have to speak individually with the foreign ministers of all 27 countries, synthesise a draft position which would also have to be amenable to the Commission and then re-circulate that to national governments for their approval whilst responding to very fast-moving events… and the implication of your criticism is that national governments should hold back from declaring their own positions until a common approach can be formulated. The high representative has been given the task of establishing common policy without (thankfully, in my view) the streamlined processes with which to achieve that end. Her alternative is to come out early (perhaps with some consultation of the bigger countries) and work to bring national governments into line with her decision after the event. You’re probably right that she lacks the ability to do this, but she also lacks the support. It would not be too complex to have managed to get something out on Thursday or Friday. Get all the PSC Ambassadors to discuss the matter, agree a text, circulate for sign-off, and get a common position announced among the 27. But the question here is where does the initiative come from, the leadership, the determined way forward? Would any Member State really have objected if Ashton had said end of last week “I am hoping that Monday’s Foreign Affairs Council will be able to agree a common position that dialogue between Mubarak and the opposition should be the way forward”? @Brittopic – until the last few days I would largely have agreed with you. The problem is that now she is *so* weak, and *so* bypassed that not only do the larger Member States choose to act multilaterally, but they will also have to explain why they did not do all of this via the EU, and to the latter charge there is no answer but to say that they do not think EU foreign policy is working. On the administrative groundwork – the rumours on the Brussels grapevine indicate that even that is not working as it should, and that Ashton lacks the capability to take basic administrative decisions. 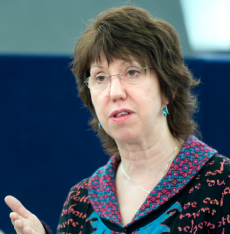 Baroness Ashton is restrained by the fact that no national government really wants her jumping their gun and taking on an initiating role in foreign policy matters. No matter what Nicolas Sarkozy and Angela Merkel say, they would much rather be making these announcements themselves (Sarkozy more than any other) and the UK is governed by a party which opposes the principle of the European External Action Service itself. The reason that Catherine Ashton was chosen for the inaugural post was that she is inoffensive to national interests. She can plod along doing the groundwork (i.e. actually setting up the Service so that when she does speak, she is armed with some clout) until such time as the EEAS is an inescapable fact for national governments and she can be succeeded by someone more bothersome. The risk of having a ‘character’ in the post would be that, in negotiations regarding the setting up of the Service, he or she would irritate member countries too much to make the king of progress which you would like to see. What is more interesting, frankly, is that the UNSC has not convened on this matter. After Tunisia experienced its revolution, the prospect of contagion was absolutely clear: we knew that it would happen in Egypt or, perhaps, Jordan or Algeria very soon afterwards. There seems to have been no plan for this, no peacekeeping force or crisis mission on standby in case it all got out of hand. She is a waste of space at this position. God why did David refuse this job when it was given to him on a plate! ?